It's fun, fast and easy! 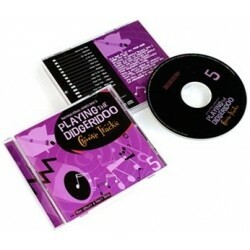 This is the 5th CD of 5 in the “Playing the Didgeridoo” series. It’s time to let all of your hard work pay off. This awesome CD contains 9 backing tracks and 5 tempo tracks designed to compliment your didgeridoo playing. From a gentle drone to complex rhythms, these backing tracks will make you sound fantastic! Use any didgeridoo in any key and let these grooves bring out the performer in you! The perfect CD to finish off the series - The perfect CD to unleash your didgeridoo style! What does the Australian Treasure team think? After checking out hundreds of different didgeridoo lesson CD’s, DVD’s, websites & books for sale around the world, we can confidently say the “Playing The Didgeridoo” series is the most cutting edge, easy to follow, high quality didgeridoo lessons we have come across. It is by far the best way to learn how to play the didgeridoo, from the beginner to the performer. We recommend it highly!